If there’s one guitar that sums up the craze for collecting, it’s the sunburst-finish Les Paul Standard made for just a few years between 1958 and 1960. This is the book where I zoom right in on that instrument. It’s a remarkable story, and one that I first dipped into with Million Dollar Les Paul (more on that one here). Here, however, I tell the story in our familiar format: a detailed main story, interspersed with dozens of luscious pictures, and a reference section up the back with the detailed facts. It proved to be a popular combination, with some great reviews and feedback. 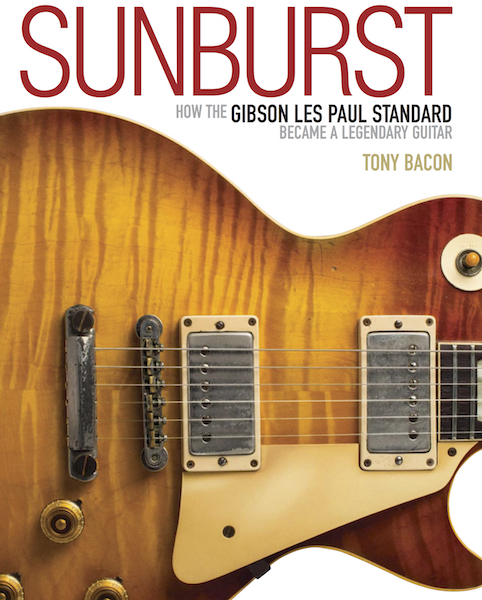 I did this interview with Gibson.com about the book. I looked hard at all the key instruments in the early history, the Bursts belonging to Clapton, Page, Green, Allman, and more. I talked to players, collectors, guitar-makers, and dealers as I unravelled the myth and tried to put history into focus. The idea also was to show exactly where this guitar has ended up now, so I investigated all the reissues and special editions and signature models that have followed the originals. Don Felder, Billy Gibbons, Joe Bonamassa, Rick Nielsen, Steve Lukather, and Keith Nelson helped me explain how the Burst fits into their musical world, and how a valuable guitar thought at one time only to inhabit bank vaults is slowly returning to its natural habitat … the rock’n’roll stage. One important footnote: I finally got to interview Jimmy Page in August 2014 … just too late to include in this book. Damn! But here’s an extract from that interview.